Mezzmo is easy-to-use and has a well designed layout. You can organize your collection of videos, music and photos into playlists and folders so they are easy to find and play on your devices in your home. Mezzmo will work with multiple UPnP and DLNA devices in your home and can stream to all of them at the same time. 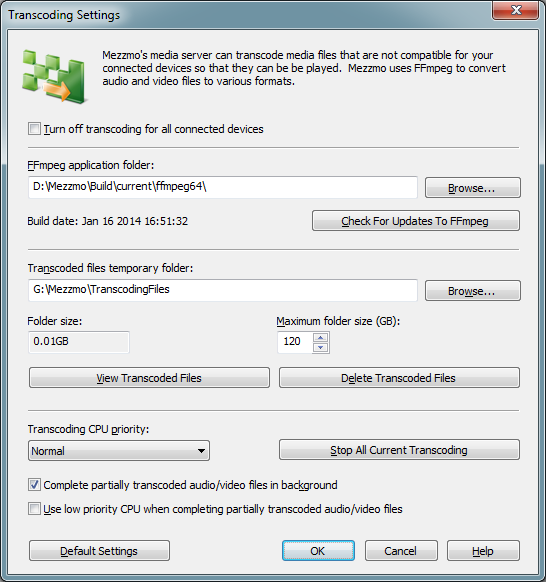 You can configure each device's settings in Mezzmo so your files stream perfectly. Full context-sensitive help is available in Mezzmo. Simply click F1 on any screen in Mezzmo and you will be able to read detailed explanations of what to do. Click on the thumbnail images below to view full-sized screenshots of Mezzmo. There are many video clips on web sites like Youtube that demonstrate Mezzmo in action with DLNA TVs, Blu-ray players, games consoles and other UPnP and DLNA devices. Click here to watch a small selection of helpful videos created by Mezzmo users. Mezzmo finds all your movies and adds them into your Mezzmo library. Great-looking poster artwork, backdrops and text metadata is retrieved so your collection is well organized and easy to browse and play on all your DLNA devices in your home. Mezzmo finds all your TV show videos and adds them into your Mezzmo library. They are automatically organized by TV series name, season number and episode number so your collection is well organized and easy to browse and play on all your DLNA devices in your home. 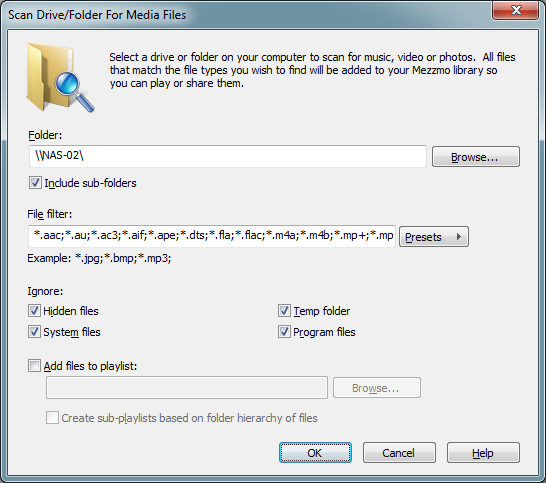 Mezzmo finds all your music files and adds them into your Mezzmo library. Album artwork, backdrops and song metadata is retrieved so your collection is organized using artist, album and genre attributes. Mezzmo finds all your photos and adds them into your Mezzmo library. EXIF, ITPC and XMP photo metadata is retrieved from your photos so your collection is easy to browse and play on all your DLNA devices in your home. Mezzmo collects and displays detailed information about videos, music and photos. Full text metadata is displayed with great-looking poster artwork and backdrops. 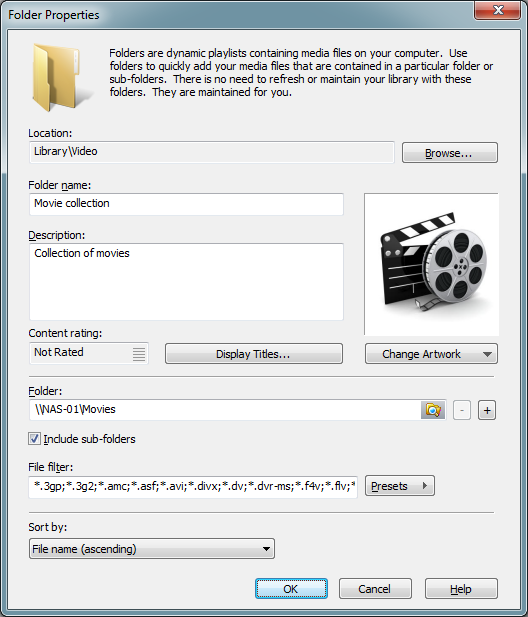 The Add Folder dialog lets you choose a folder where your media files are. 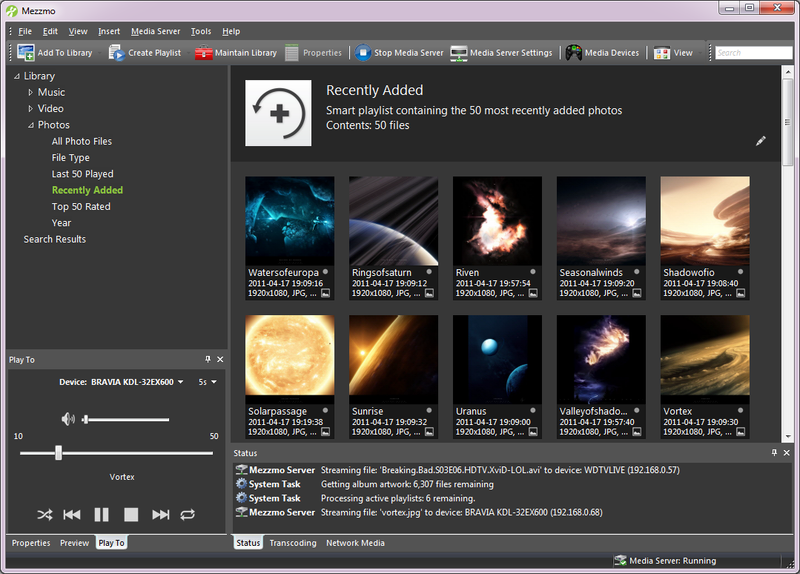 Mezzmo finds all media files in the folder and sub-folders and adds them into your Mezzmo library. Any changes you make to this folder (new files, new sub-folders, etc.) 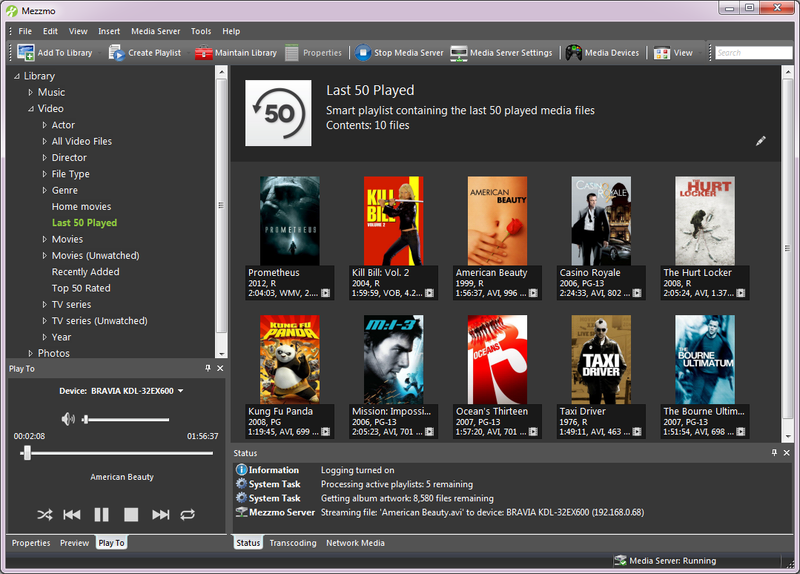 are automatically detected and updated in your Mezzmo library and on your DLNA devices. The Scan dialog lets you find all the media files on your NAS or computer that you want to add into Mezzmo. Mezzmo also collects information about the files such as title, series, season, episode, album, artist, genre, artwork and release date so that your files are well organized. 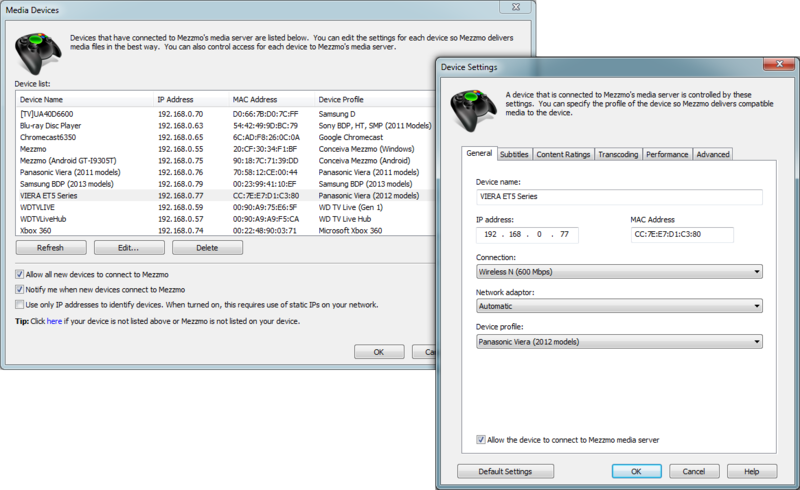 The Media Devices dialog lists all the DLNA devices on your home network that Mezzmo has detected and can stream to. You can configure each DLNA device so that Mezzmo streams perfectly to all your DLNA devices. Settings include device profile, connection type, video size, video bitrate, subtitles and more. 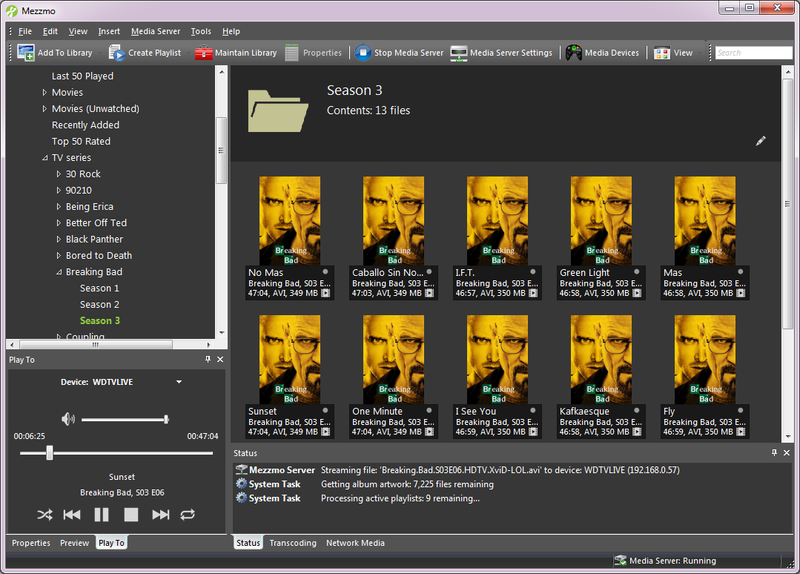 The Get Online Video Metadata dialog lets you find artwork and text metadata for your movies and TV series. 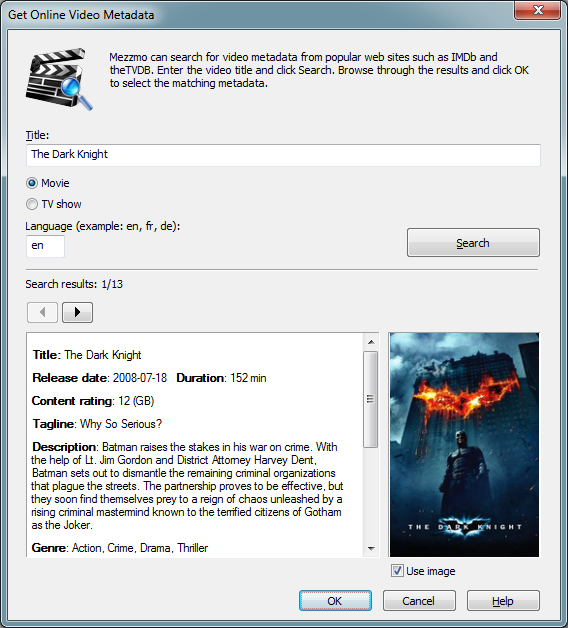 Mezzmo automatically searches online web sites for movie and TV show information. Text metadata retrieved includes title, series, season, episode, actors, directors, release date, description and more. The Smart Playlist dialog lets you create playlists in your Mezzmo library so that you can quickly find and play your media files on your DLNA devices. 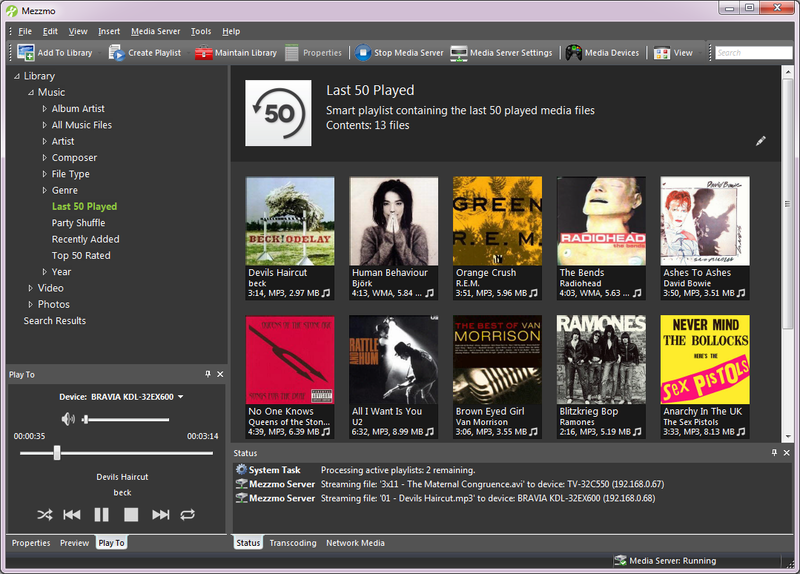 Mezzmo supports several different type of playlists - including smart playlists, active playlists and linked playlists. 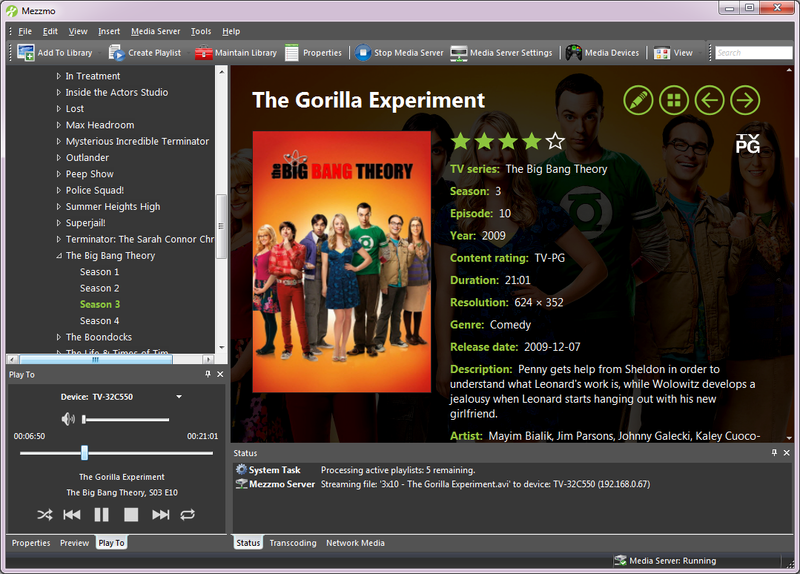 The Pre-transcode Files dialog lets you transcode your files before streaming them to your DLNA devices. Perfect for computers that cannot transcode on-the-fly fast enough and when videos are stuttering when streaming. Perfect for DLNA devices that do not let you FF/REW transcoding files. Perfect for mobile devices that only support file formats which cannot be transcoded and streamed in real-time. The Properties dialog lets you edit the attributes of your media files in your Mezzmo library. 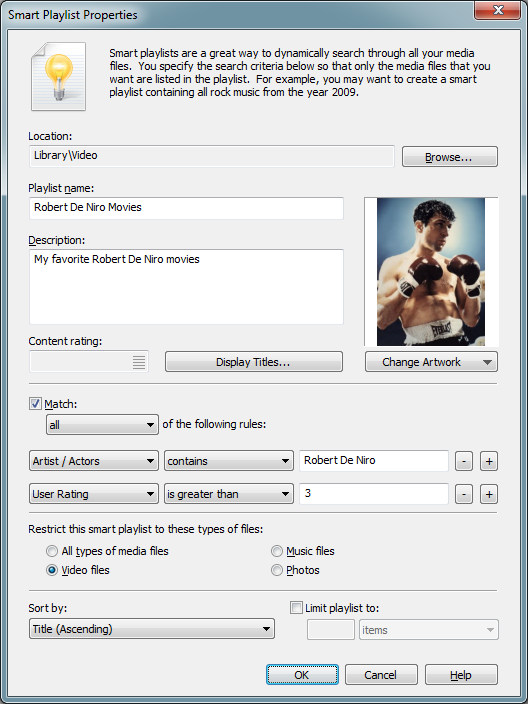 Artwork and text attributes are streamed to your DLNA devices when you browse your folders and playlists. The Subtitle Settings dialog lets you configure how you want subtitles streamed to your DLNA devices. Mezzmo supports streaming external subtitles, embedded subtitles and can burn subtitles. 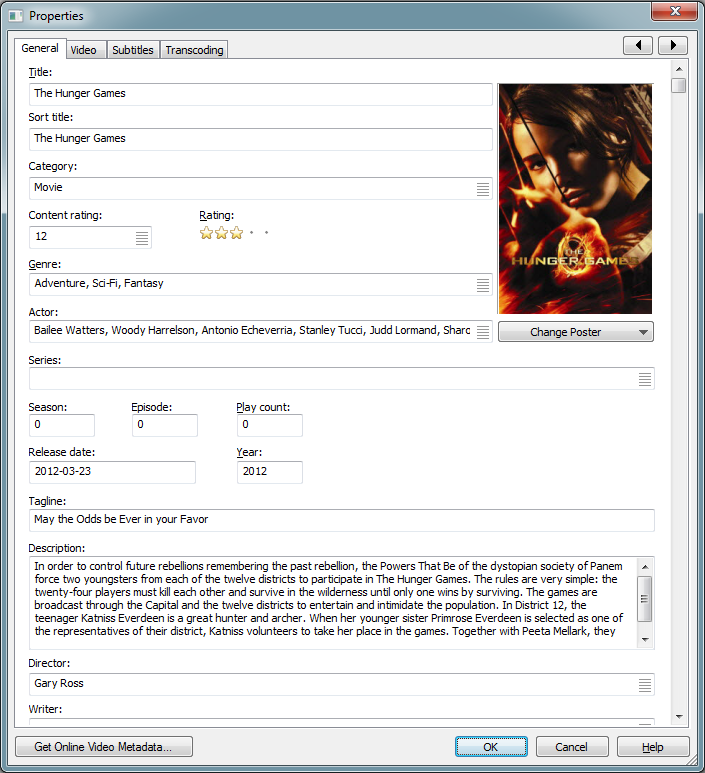 All popuar subtitle formats are supported. This ensures you will always see subtitles on your DLNA devices when streaming a video from Mezzmo. 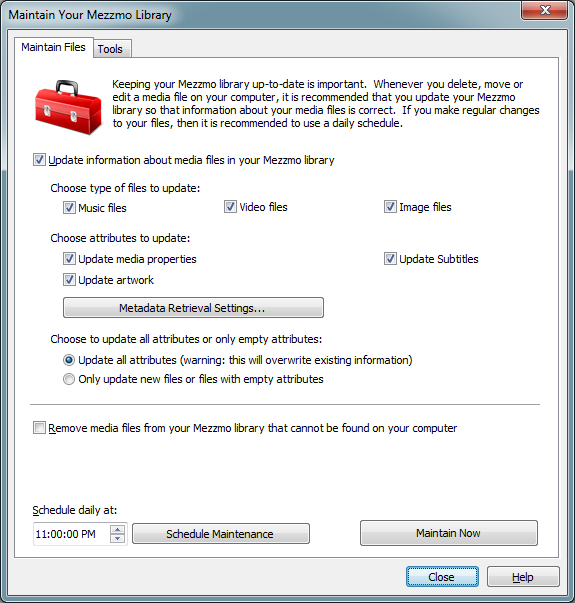 The Maintain Library dialog lets you keep your Mezzmo library up-to-date. It finds news files and updates information for your existing media files. Schedule maintenance for overnight so its ready for you the next time you use Mezzmo. The Transcoding Settings dialog lets you configure how you want to transcode non-compatible media files so they can be played on your DLNA devices in your home. 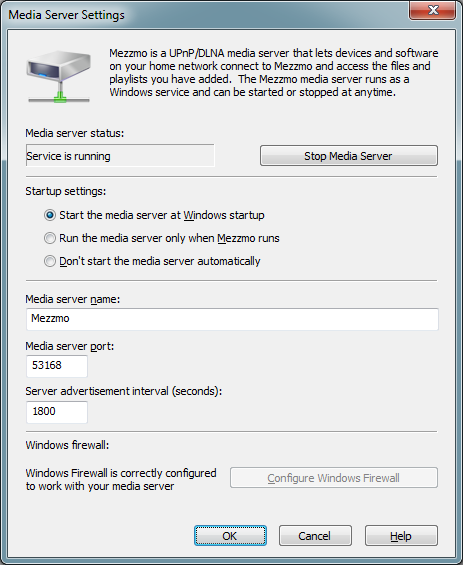 The Media Server Settings dialog lets you configure your Mezzmo media server so it works perfectly with the DLNA devices on your home network.